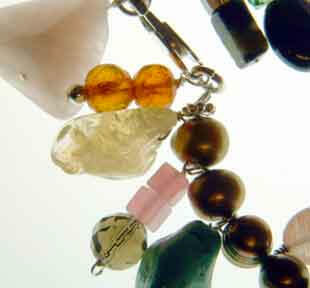 Paula's original handmade jewelry is sold under the name St. Rocco. and sterling silver. Each piece is finished with a tiny sterling silver charm which reads St. Rocco. 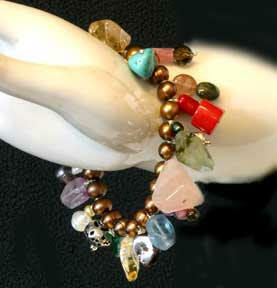 Paula uses a wide variety of stones, often in unusual combinations. Her emphasis is on color, texture and the use of reflected light. 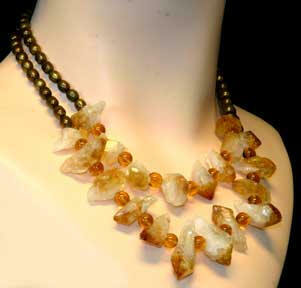 You'll find that most of these pieces can work as both special occasion or everyday ornaments. ...and of course, they are one-of-a-kind. 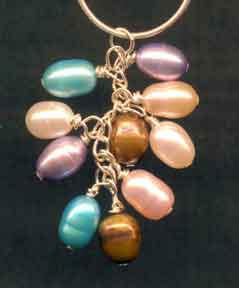 Striped fluorite, genuine freshwater pearls, fluorite beads, sterling silver beads and lobster-claw clasp. 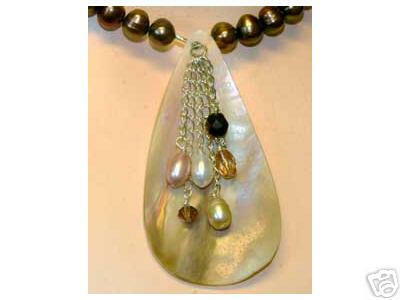 amethyst and citrine crystals, large faceted colored quartz pendant, bronze colored freshwater pearls, all metal is sterling silver. Large black/peacock freshwater pearls, sterling silver beads, vintage West German crystal, artisan-made pendant of blue topaz, dichroic class, opalite. 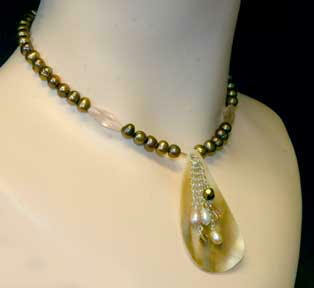 Choker made of mother-of-pearl, freshwater pearls, citrine, pink jade and glass crystal, sterling silver twisted rope s-hook clasp. 16" choker with violet quartz pendant. 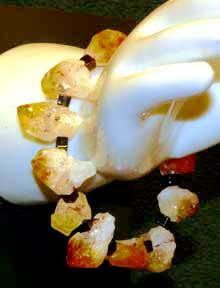 Three strands of citrine, garnet and pink jade beads. Sterling silver hook clasp. 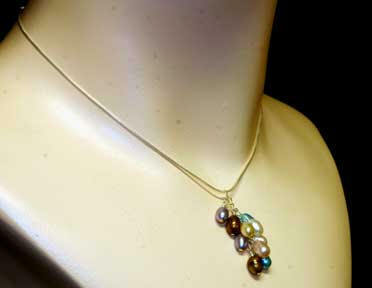 Choker made of olive colored freshwater pearls, faceted faux aquamarine. 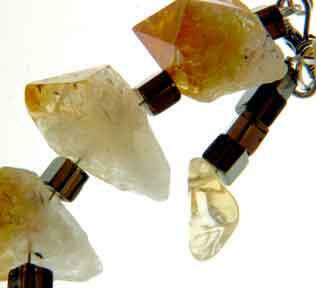 I believe the clear briolettes with black inclusions are quartz. All finished in sterling silver with an s-hook clasp.